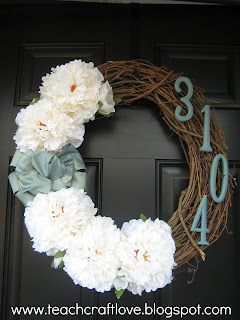 I love the idea of crafts, but I don't really do them (until today that is!). 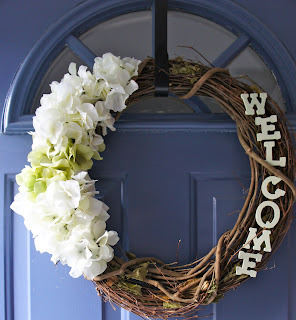 I've been browsing Pinterest for cool craft ideas and I came across this cute DIY wreath created by teachcraftlove.blogspot.com. My front door was looking a little naked since the x-mas decorations came down, so I decided to give it a try. It also gave me an excuse to buy a glue gun. Watch out, I'm armed and dangerous. I'm pretty happy with the end result, though I have to admit that I still like hers like 10x better. The space between the "L" and the "C" is driving me a little crazy, but I'll learn to live. I think the house number is super cute, but I decided to spell "Welcome" instead since my house number is right next to my front door. Pretty! It came out really good jess!